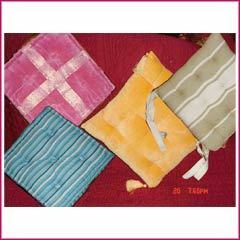 Floor cushions are one of the most fashionable home furnishing accessory in market which is supplied to a large number of clients in domestic and international market. These products are manufactured by using superior quality raw material which provides longer life and strength to the products we manufacture. We offer our products as a leading manufacturer and exporter, of the most stylish and decorative range of Home furnishing like embroidered curtain, duvet cover which has been appreciated world wide due to the superior designing and prints.